North Korea - South Korea diplomacy flourishes, but what about Kim Jong Un's nukes? SEOUL, South Korea -- North and South Korea continued their push for peace Monday with high-level talks that resulted in a host of agreements, including a plan by the rivals for a groundbreaking ceremony this year on an ambitious project to connect their railways and roads. The agreements come amid unease in Washington over the speed of inter-Korean engagement. Many outsiders believe that U.S.-led efforts to rid North Korea of its nuclear-tipped missiles are lagging significantly behind the Koreas' efforts to move past decades of bitter rivalry. There was also controversy over a decision by South Korea's Unification Ministry to block a North Korean defector-turned-reporter from covering the talks at the border village of Panmunjom over concerns of angering North Korea. This drew a fierce reaction from other journalists, who accused the ministry of infringing media freedoms and discriminating against North Korea-born citizens. A series of weapons tests by North Korea last year, and an exchange of insults and threats between U.S. President Donald Trump and North Korean leader Kim Jong Un, had many on the Korean Peninsula fearing war. But there has since been a surprising peace initiative, with three inter-Korean summits and a June meeting in Singapore between Trump and Kim. The U.S. and North Korea are working on plans for a second such summit. Still, there is widespread skepticism that North Korea will disarm. And, despite the fanfare for the proposed railway and road projects, the Koreas cannot move much further along without the lifting of international sanctions against North Korea, which isn't likely to come before it takes firmer steps toward relinquishing its nuclear weapons and missiles. South Korea's Unification Ministry, which handles affairs with the North, said in a statement that the government will share details from Monday's meeting with the United States and other nations and will closely coordinate with them to avoid any friction over sanctions. The ministry said the rivals agreed Monday to hold general-level military talks soon to discuss reducing border tensions and setting up a joint military committee that's meant to maintain communication and avoid crises and accidental clashes. 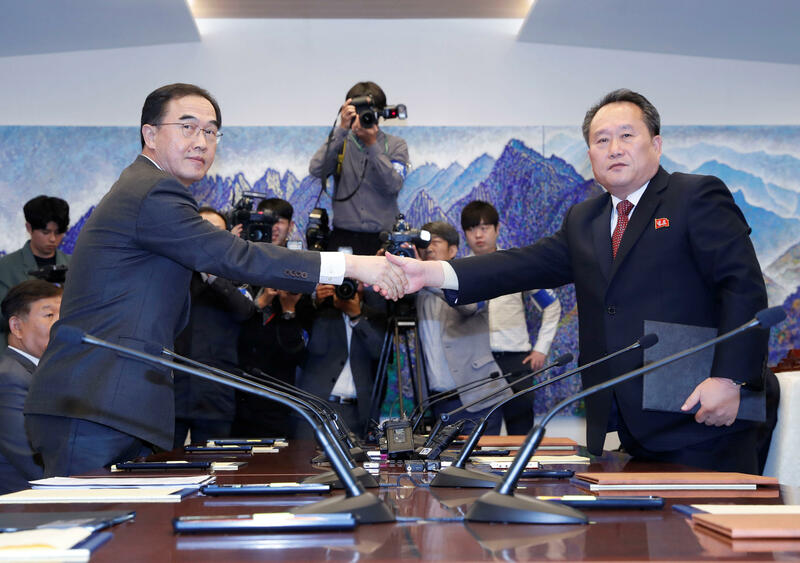 And the two countries will hold Red Cross talks at North Korea's Diamond Mountain resort in November to set up video-conference meetings between aging relatives separated by the 1950-53 Korean War and potentially expand face-to-face reunions between them. Monday's talks were aimed at finding ways to carry out peace agreements announced after a summit last month between South Korean President Moon Jae-in and Kim in the North Korean capital of Pyongyang. South Korean Unification Minister Cho Myoung-gyon said it was meaningful that the Koreas are getting faster in reaching agreements as their diplomacy gains traction. His North Korean counterpart, Ri Son Gwon, who heads an agency dealing with inter-Korean affairs, said "no group and no force will be able to prevent the path toward peace, prosperity and our nation's unification." However, South Korea's enthusiasm for engagement with its rival appears to have created discomfort with the United States, a key ally. Moon's government last week walked back a proposal to lift some of its unilateral sanctions against North Korea following Mr. Trump's blunt retort that Seoul could "do nothing" without Washington's approval. South Korean Foreign Minister Kang Kyung-wha also said U.S. Secretary of State Mike Pompeo expressed displeasure about the Koreas' military agreements. Kang was not specific, but her comments fueled speculation that Washington wasn't fully on board before Seoul signed the agreements. Trump has encouraged U.S. allies to maintain sanctions on North Korea until it denuclearizes to maintain a campaign of pressure against Kim's government. Unification Minister Cho said his call to exclude North Korea-born Kim Myeong-sung from a pool of reporters covering the meeting was an "inevitable policy decision" to improve the chance for successful talks. He said the ministry would work harder to assure that North Korea-born defectors can report on North Korea issues without restrictions. But he didn't offer a straightforward answer when asked whether he would make the same decision in the future. Unification Ministry spokesman Baik Tae-hyun earlier said North Korea did not demand that Kim be excluded from covering the meeting. Kim is a reporter for the conservative Chosun Ilbo, South Korea's biggest newspaper, which has been largely critical of Moon's policies. The South Korean press corps covering the ministry issued a statement denouncing it for a "grave infringement of media freedoms."